For everyone else still stunned over the Minnesota Timberwolves' owner and general manager downright daring the franchise's best player to leave for free agency in two years, Kevin Love promises to be a professional, promises All-Star performance and productivity. Over the organization's refusal to designate him as the cornerstone, though, there come no promises of forgiveness from Love. No assurance it won't chase him out the door and out of the franchise forever someday. "I don't know who labels people stars, but even [T'wolves owner] Glen Taylor said: I don't think Kevin Love is a star, because he hasn't led us to the playoffs," Love told Yahoo! Sports. "I mean, it's not like I had much support out there. "That's a tough pill to swallow." 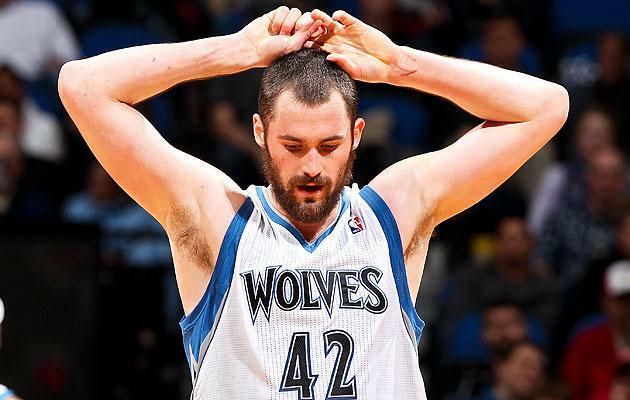 No, Kevin Love isn't over Taylor and GM David Kahn refusing him what he had earned. He isn't over Kahn marching into the trainer's room after a loss and thrusting a contract offer sheet into his hands. Where else does it work that way in the NBA? "I'm not the one to always follow professional protocol – but I do know what it is, even at 24 years old," Love says. Perhaps those issues wouldn't still be so raw had the franchise responded differently when Love broke his hand in a preseason workout. In a regimen he's done most of his life, Love fractured a bone thrusting himself to his feet upon completion of a round of knuckle pushups. He missed a month on the floor, but his ears missed nothing from those in management whispering that maybe the injury didn't happen the way Love insisted it did. "Even people in my own organization were asking if it was a legitimate injury, people calling my honesty and integrity into question," Love says. "And that's what really hurt me." Across a table in a downtown Philadelphia steak house recently, Love digs into a shrimp cocktail and considers the futility of the regime that passed judgment on his future, the power it holds over his championship aspirations. As much as Love believes strongly in the greatness of coach Rick Adelman, Kahn has offered no reason for faith in his own wayward vision. "You walk into the locker room every year, and it's completely turned over," Love says. "There's new guys everywhere. And then it happens again and again. You start to wonder: Is there really a plan here? Is there really any kind of a … plan?" Love doesn't want to sound "bitter over it," he says, because he understands that no one wants to hear him unhappy over a four-year, $62 million contract. In so many ways, the contract is beyond his wildest dreams. Yet the five-year, $80 million maximum designation the franchise could have given him represented the commitment he wanted to make to Minnesota, the way with which a first-team All-NBA player and Olympian should stand shoulder to shoulder with a city, an organization. 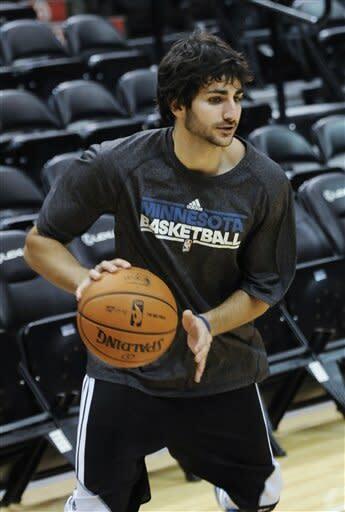 In the end, Love never wants to feel like he's pitted against young point guard Ricky Rubio, because he adores him as a teammate and a talent. Yet, the reality is unmistakable: For all of Kahn's missed picks, failed signings and flawed trades, Rubio is the player whom the GM can take full credit. Someday, Kahn wants Rubio to be his five-year, max-out star, but will Rubio want to stay in Minnesota should Love walk out the door? "It was a projection over a sure thing," Love says. "There's no question there was an agenda here. A different agenda." "I have a very, very good memory, and I always remember the people who have done right by me, and the people who have done wrong by me," he says. "It will be embedded in my brain, and something I won't forget about. There's no telling what will happen. I would love to compete for a championship in Minnesota, but …"
Between now and his 2015 opt-out, Love wants to be clear: Around him, he doesn't want merely a playoff team. He wants a team that contends. "And that's on me to do my part, to get us there," but the organization has lost the benefit of the doubt with Love. When it's time for every franchise in the NBA to clear cap space and try to sign him, Love simply understands: "I'll have the leverage." Love will never get over how badly he wanted the designation as the Wolves' franchise player, how deeply he believed it had been deserved and how Kahn was so smugly defiant in refusing to recognize it. When the Wolves should've been throwing a parade that Love wanted a five-year maximum contract designation a year ago, the franchise could forever regret the consequences of telling a superstar player he wasn't worth that commitment. For as foolish as it was to tell a first-team All-NBA forward, an Olympian, that that the Wolves would be saving the super max deal for someone else, Taylor and Kahn somehow gave into Love's insistence of an opt-out after the third year of the four-year deal. Privately, Kahn has told people that he isn't worried, that the Wolves can pay Love the most money on the market and that he doesn't believe he'll leave for less. It's a terrible miscalculation. Russell Westbrook didn't want to leave the magnificent core of talent assembled in Oklahoma City when the Thunder sold him on taking a five-year contract that was short of the maximum he could have received. OKC's management sold Westbrook on finding a way to fit so much championship talent within the financial constraints of a small-market roster, but Love's situation doesn't compare. "I haven't been in the playoffs yet," Love says. "I'm looking at my contract in the eye of two years from now, and if I haven't been to the playoffs – or it's been one playoff berth – well, it's going to be tough to say, 'Oh well, I'm going to stay here and continue to rebuild.' "
For three seasons around Love, the incompetence of Kahn's regime ruled the day. For three seasons, Love transformed his body, his talent, his productivity to become one of the most menacing scorers and rebounders in the sport. With Love and Rubio, the Wolves should be shaping into a championship contender. The Wolves had successive seasons with the sixth, fourth and second overall picks in the draft, and nothing to show for it. Jonny Flynn is out of the NBA. Wesley Johnson is on his way. And Derrick Williams – the No. 2 overall pick – will be getting one DNP after another on the Wolves' bench until Kahn finally trades him for next to nothing in the near future. Free agents were signed only to be shipped out when they didn't perform. After four years, Love does believe there's winning players on this roster, but he understands something else, too: Opportunity after opportunity was wasted to construct a sustainable contender around him, and those chances are gone forever. Love likes most of this roster now, but where's the staying power to suggest that it'll grow together? Bottom line: The Wolves should be much further along in their construction, and that's completely on Kahn. Looking back, Love still refuses to believe that dumping center Al Jefferson on Utah for picks and salary-cap space – ultimately all misused, of course – was the right choice for the Wolves. For everyone within the organization who believed that those two couldn't play together, Love still contends: Did we ever find out? "We should've at least tried it, especially with the way things were going," Love says. "I was beginning to figure things out in my second season. Everybody knew what Al was capable of, and is still capable of. It was definitely worth the risk of seeing what would happen. If it didn't work, then go another way. But we never tried it." For Love, it goes back to smart, savvy franchise building. His summers with USA Basketball taught him about organizational structure, about accountability, about an atmosphere where everything and everyone performed at the highest level to chase victory. Love admires Adelman, and knows that Adelman had significant input into bringing talent like Andrei Kirilenko to the Wolves. Yet, Love still understands that Adelman's job is coaching, and that ultimately there needs to be significant changes with which the way management complements Love and Rubio. "Look at different teams around the league," he says. "Look at a San Antonio that continues to add talent around [Tim] Duncan and [Manu] Ginobili and [Tony] Parker. Look at what happens in Oklahoma City, the players they continue to add around their star players. Even the trade they had where they lost [James] Harden, they still added players that were going to fit well in their system. And speaking of small markets, look at a team like Memphis and all they've been able to accomplish. They're getting the most out of their entire organization." Love has made the case over and over that he's hell-bent on getting the most out of himself. Two years ago, Love gave the Wolves 20 points and 15 rebounds a game. He turned it into 26 and 13 a year ago. Within the chaos of the Kahn-imposed Kurt Rambis regime, Love worked relentlessly with his personal trainer, Rob McClanaghan, and has moved to obliterate the limits that people inside and outside the game so often imposed on him. "I obviously know the color of my skin, especially in this predominately black game," Love says. "I was tagged early as the prototypical white player, the guy with the intangibles – the smart player, the guy who did all the right things. As time went on, people started labeling me as, 'Hey this guy is a pretty good player.' And it started to become, 'Maybe he can be a great player.' I was able to grow because I was able to get out of my comfort zone, and that was something that [McClanaghan] has helped with tremendously. "Randy Wittman told me not to shoot 3-pointers. That got me very uncomfortable. There were certain labels tagged on me very early in my career, spots on the floor where I felt uncomfortable. I continued to put myself out there in those spots." In some ways, Taylor and Kahn have done Love a favor. They didn't do it intentionally, because they're simply not savvy enough, but there's an anger pulsating with Love, a ferocity that they've indirectly fueled. Minnesota will be the beneficiary for the term of his contract, but beyond 2015, well, the Wolves had better pray that his devotion to the locker room, to the coach, to the fans, overtakes his distaste and mistrust of them. For now, though, the owner and GM who should've wanted to hold a parade when Kevin Love was willing to commit to five seasons are simply two more venomous voices pushing him harder and harder. "That's the crazy thing about this: There's this whole [expletive]-up, cynical thing going on in my head, where I love people telling me what I can't do, telling me this is what you're going to be, this is your ceiling. Just everybody projecting for me. I'm not breaking any bounds or barriers saying this, but I think all kids – white, black, purple, whatever color – in basketball should never put a limit on themselves. "I've had plenty of people tell me who I was going to be, and I feel like, for the time being, I've exceeded that." For now, the franchise player of the Minnesota Timberwolves plays on with an understanding that sooner than later, he makes the choice on his future. 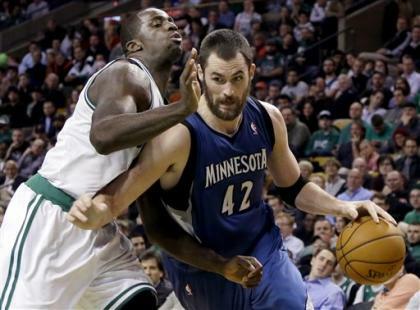 If losing Kevin Garnett set back the Wolves, just watch how it turns out should Kevin Love walk out in his mid-20s. Somehow, the Wolves let this happen. Somehow, Glen Taylor and David Kahn are daring him. Pity the poor Timberwolves.